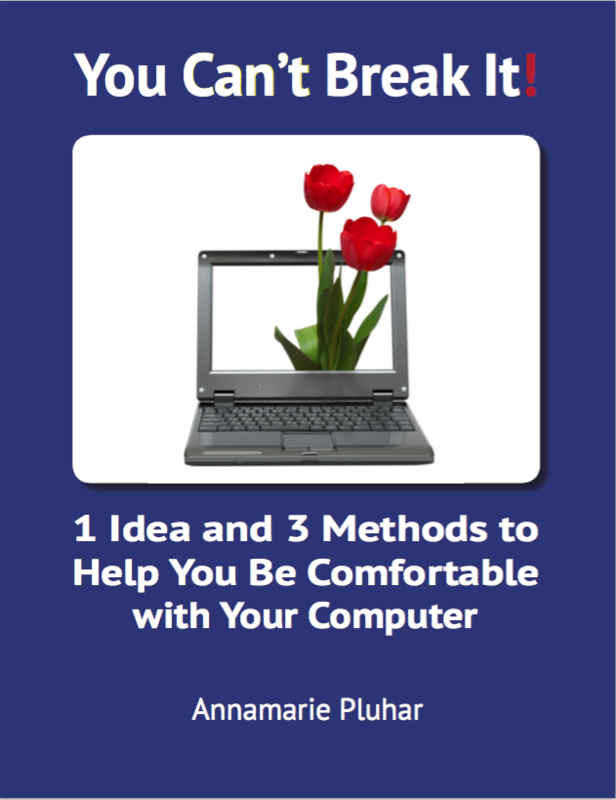 Do you want to feel in control of your computer, tablet or phone? If you had lived in the woods your entire life and were suddenly transported to a city street where you stood on the corner of two intersecting streets, there might be a tall post in front of you with three lights on it. If the bottom light were lit up and red would you know what that meant? Of course not. 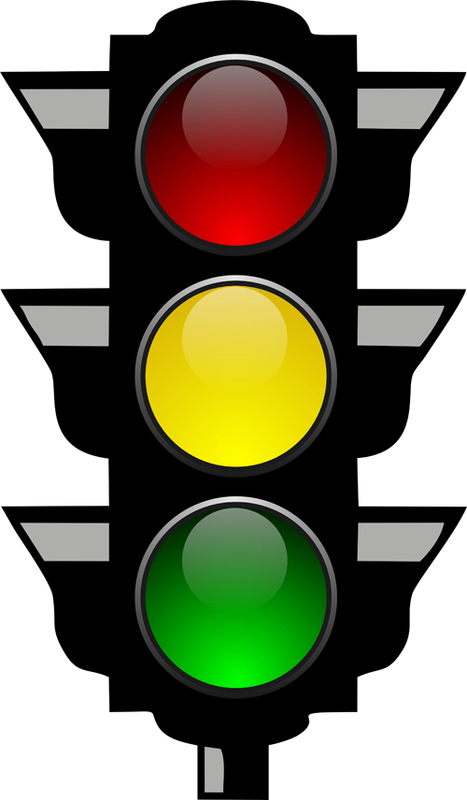 Reading a traffic light is a learned behavior. On computer screens, tablets, and smartphones symbols are used to indicate to the user where more information is available. This “Gentle Bytes” article addresses those little (sneaky) triangles that are on your computer screen. Not all my clients have realized that they have a function, so here’s a short description. I hope you find it helpful. Apple, Microsoft® and Google use slightly different symbols. The little triangles in the screenshot below indicate there is a folder inside the folder. All the triangles point to the right which is the closed position. 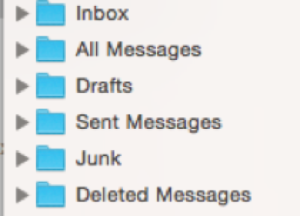 Clicking on the Inbox arrow reveals the folders inside the Inbox folder. Anywhere you see a triangle like this, clicking on it will show what’s in it. Clicking again will close the triangle. It’s a toggle. Microsoft and other programs use a similar symbol. 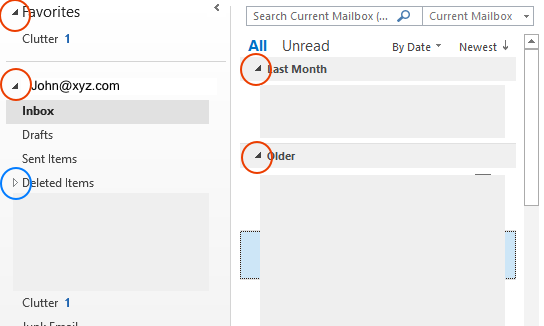 Here is the symbol in Microsoft Outlook 2010. The four red circles show the triangle open. The blue one shows it closed. 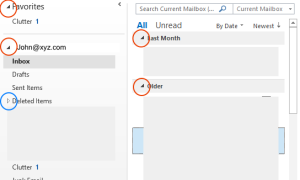 In Microsoft® programs: Word® , Excel® , Outlook® , PowerPoint® there is a “ribbon.” As you can see in the screenshot below, all the triangles used in the ribbon are circled in red. Though the screenshot isn’t very clear you can see how many there are! Each one when clicked helps the user do something with the computer. One gotcha is when the ribbon is closed. See the triangle circled in blue? That will close the ribbon. When the ribbon is closed a small triangle will show on the right side in that area. Clicking it will open the ribbon. Google also uses triangles to indicate where more information is. 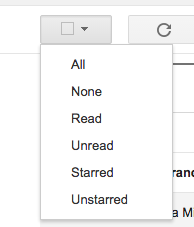 Here are some screenshots from Gmail. See the triangles? In these screenshots they are clicked to reveal what they contain. When you see a triangle, click on it to learn what it can do for you! Click on it again to return to where you were. The triangle is beginning to be a universal symbol on any computer, tablet or digital device. Learn to look for this symbol. Find out what information it contains. It might be just what you are looking for! Fill out the form below to receive your free copy. This will also subscribe you to our newsletter, "Gentle Bytes." * We would never share your email.